Pavlos Foskolakis is a digital marketer, born and raised in hotels, a global traveler who has lived in 6 countries, certified by some of the known giants in the digital marketing industry, like Google, Facebook and LinkedIn. Over a decade now, Pavlos has been on a marketing journey with the greatest leaders in the hotel industry, Starwood Preferred Guest Hotels & Resorts, lately been taken under the wings of Marriott International, the world’s largest hotel company, counting more than 6,000 properties in 122 countries. 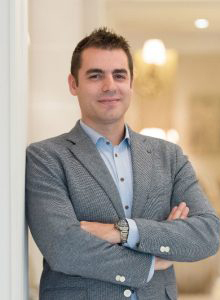 During his current role, Pavlos has been directly leading a team of digital experts, building a network of marketing excellence and establishing a best in class digital marketing culture within the company, for 47 hotels and resorts in 12 countries. An important stop in his journey, the flagship of Greek hospitality – Hotel Grande Bretagne – where Pavlos got the opportunity to start exploring a variety of tech tools & platforms, combining digital with traditional marketing strategies and further focusing on guest experience. A great amount of his work over the past years has been focusing on destination marketing, promoting Greece, as well as on brand marketing, promoting The Luxury Collection portfolio.